Every pound in subsidy payment received by farmers is worth more than £7 to the wider economy, they say. They say the money is spent on feed, fertiliser and fuels, as well as a range of services. The findings are in a report commissioned by the National Farmers Union, which contains a regional breakdown. In Northern Ireland, £486m was spent on a range of goods and services by farmers in 2015. That is just more than three per cent of the UK total. 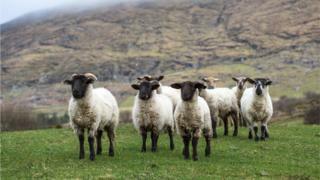 The value of agricultural output in Northern Ireland was £354m in 2015 and the industry supported 47,000 jobs, according to the report. Farm unions are keen to secure continued support payments from the UK government post-Brexit. UK farm ministers have said that the industry will continued to be supported, but have suggested that may take forms other than direct payments. The report was welcomed by Ulster Farmers' Union president Barclay Bell. "Clearly, the contribution of farmers to the economy should not be overlooked and this report backs our calls that agriculture needs to be a priority as preparations get underway for leaving the EU," he said. The report says agriculture is an important industry in all parts of the UK, but particularly in Northern Ireland, Wales, Scotland and parts of England.